An article published last month from The New York Sunday Times reports the Association of American Medical Colleges estimates in 2015 the country will have 62,900 fewer doctors than needed. And that number will more than double by 2025, as the expansion of insurance coverage and the aging of baby boomers drive up demand for care. Even without the health care law, the shortfall of doctors in 2025 would still exceed 100,000. "We have a shortage of every kind of doctor, except for plastic surgeons and dermatologists. We'll have a 5,000-physician shortage in 10 years, no matter what anybody does," states Dr. G. Richard Olds, founding dean at the School of Medicine at the University of California, Riverside. So how many times have you called the doctor with a medical complaint, waited days for an appointment, spent time driving to the office, sat captive in the waiting room for hours, and then visited with the physician for less than 15 minutes? Sounds like a nightmare now, but will we be at the point in 2022 where it is going to be really difficult to even make an appointment or call a doctor? This is where the value of telemedicine – consulting with doctors through your computer, smart phone, tablet, or better yet, a VGo – becomes vital to our collective health and wellbeing. No need to go through all that inconvenience for routine visits or consultations. With video chats, computers and mobile devices such as VGo, patients can see their doctors virtually without leaving home. Allowing a doctor, a nurse or a caregiver to be more productive and available to their patients through technology is the way to help with the projected clinician shortage. Industry experts, such as Dr. Eugene Spiritus say that communication is the key to good health care. Dr. Spiritus has often commented that care is about seeing the patient, talking with the patient, having a face to face. There is something about the presence that a VGo brings to the equation that not only makes healthcare more accessible and affordable, but more personal. Having a doctor or nurse making a visit from a remote location will help offset the shortage of clinical expertise. Telehealth solutions, promise to have a profound impact on patient care, its quality and safety, and can also help drive costs out of the healthcare system. For instance, enabling the chronically ill and elderly to receive care at home reduces the number of hospital admissions and re-admissions, which are riddled with expense and risk of exposure to other illnesses. 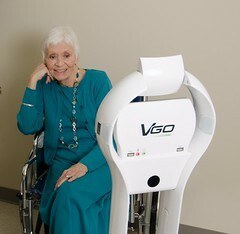 And VGo does all that by facilitating communication for the clinician and the patient.